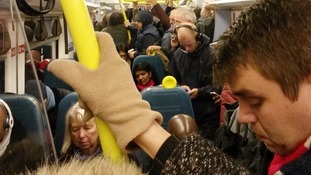 Is your train among the most overcrowded in the country? "The Face of Suffrage" is made up of a mosaic of more than 3,700 images of women from across the West Midlands and the UK. The city centre terminal has a 92 per cent approval rate. The top 10 most overcrowded trains in England and Wales have been revealed - as figures show some are carrying over double their capacity. Virgin Trains built the UK’s largest ever replica train made entirely from 2000 presents at Birmingham New Street station today. According to stats from the Government’s Forced Marriage Unit, the West Midlands has the second highest number of forced marriage victims. There are delays on London Midland trains this morning at Birmingham New Street and Crewe. It's the last day at work for the man who has been the voice of Birmingham New Street station for the last twenty five years. Andrew Smith is leaving after a quarter of a century doing station announcements at the station. Andrew Smith is moving on after a quarter of a century doing station announcements at the station. When you've been the voice of Birmingham New Street station for twenty five years, you do have to make the occasional odd announcement. On his last day in the job, we asked Andrew Smith about the strangest thing he's ever had to read out on the tannoy. The man who has voiced train announcements at Birmingham New Street for over a quarter of a century is set to leave the post today.